If you aren't watching curling at the Olympics, you have to start. 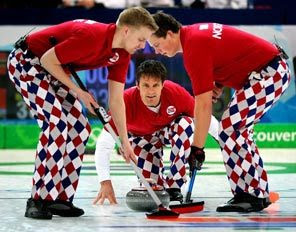 I mean seriously - tune into a Team Norway men's game and take a gander at these... 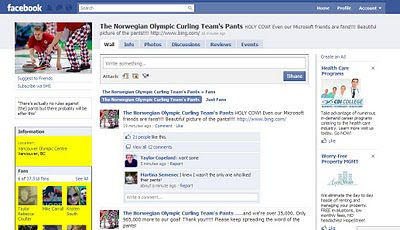 Even Microsoft has proclaimed their love of the pants on bing.com... There is a Facebook group for the pants - make sure that you join the official group! And, if you really feel the need to get into Norway's pants (so to speak of course)... you can buy yourself a pair - for a steal at $89.99! In a sport where a team's uniform is of no advantage/disadvantage to a team's record - I say go for it! Make a statement! I love it! I am so in love with these pants!